Developer Coilworks has announced the Cloudbuilt Level Editor. Cloudbuilt, Coilworks’ high-speed action platformer, has received high praise from the game’s fans since its release a year ago. Now, with the help of the Steam Workshop, fans can make their own levels and enjoy unlimited parkour action. Steam Workshop will allow users to effortlessly upload levels and browse levels other users have made. To celebrate its release, Coilworks and publisher Rising Star Games are having a sale on Cloudbuilt, dropping the price to $9.99 on Steam until March 25th. They are also running a contest. 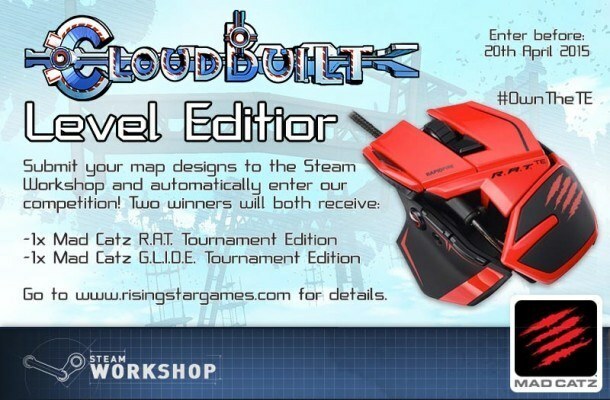 If they can make the best Cloudbuilt levels, two winners will receive the Mad Catz R.A.T. Tournament Edition mouse and a G.L.I.D.E. mouse mat.